I prefer bottles with caps. If you can’t see it while drinking drink, don’t drive, driver. Wow! It’s ‘It’, ‘The Thing’ and drinking drinking drinking drink, all at the same time! If you do see it you’ll spurt out your drink and it will soil the ground. I see what you did not do there. The thing which the chief does not have after finishing drinking would be a thirst. I’d like to see that! Drink is the curse of the seeing class. If the chief likes you, you can drink the Pet. Today is adopt a pet cap Sunday. You mean the chief has no pink elephant? Because of the size of my beer belly, I can only see it while lying down. 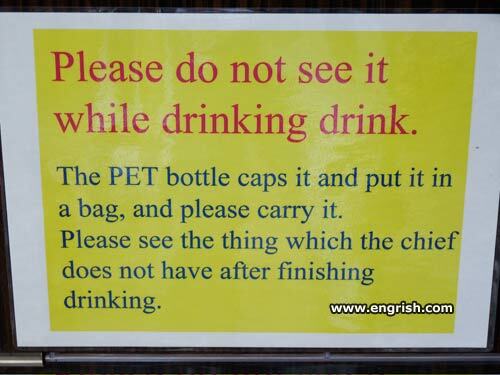 Therefore.I don’t have to worry about seeing it while drinking drink. And after a night of drinking, I’m more worried about shrinking shrink. I don’t know what that thing is, but it sure values its privacy. If it I can’t see it when I’m sober, how am I supposed to see it when I’m drunk? Is the PET bottle the new pet rock craze? The chief can do his own hallucinating. I shouldn’t be expected to have to try to see what he doesn’t have. And how would I know it if I can’t see it? See the manager! Wow. Sure wish I knew where in Japan these sign resting rests so I could going go seeing not see it. The Commodore PET bottle prevents drink spiking with hallucinogens. You’ll never see the “thing”. The question is, can the chief see it while drinking? Rarely, if ever, has a pronoun been in such need of an antecedent. The Chief does not have a lot of things. Which am I supposed to see? If you thought you were confused after the first sentence, just keep reading! I don’t want to see the thing that the chief doesn’t have!!!! I’ve got the chief’s thing. They’re right, you don’t want to see it without a drink.